They were rushed to hospital, one boy was recovered from the debris later. 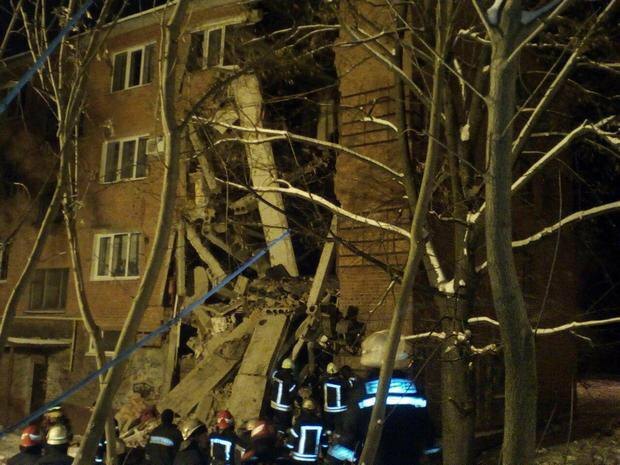 A wall of the building hosting a dormitory of a sewing factory in Chernihiv has collapsed, the local news website 0462.ua has said. According to the State Emergencies Service, seven people have been rushed to hospital. Two more people are believed to be trapped under the debris, one of them is showing signs of life. A wall in one of the sections of the four-storied dormitory in 16, Popudrenko St went down at 1620 Kyiv time. There was a crack in the wall which appeared because of the absence of hydro isolation above the shower rooms, the website said. UPDATE: A 12-year-old boy was recovered from the debris at 1836 Kyiv time, according to the State Emergencies Service. It said the collapse was caused by a blast on the fourth floor which did not produce a fire.